During my time in Thailand, I decided, in my spur of the moment kinda way, that I’d take a couple of days out and head to Cambodia. This is mainly because I thought it’d be fairly straightforward. I have rarely been more wrong. We join our intrepid, sweaty, and slightly over enthusiastic traveller on an incredibly hot day, at the side of a dusty road in the outer suburbs of Bangkok. Can you picture it? Yes? Ok, then: let’s go! When the bus screeched to a stop at the roadside and my Thai friend and I were invited on, I realised that it was too small for the number of occupants. Not to a scary degree, but certainly nothing that would have eluded a Police stop and several license points in the UK. We had 16 passengers on a 12-seat minibus, which was heading on a 4-hour journey to the east, and had no air conditioning. It was the hottest place I’ve ever been and never before have I managed to contort myself to fit in such a tiny space. About two minutes after pulling away into crazy traffic, I realised that I was half sitting/half standing/fully squished next to The Incredible Spitting Woman of Bangkok. For the next four looong hours, she cleared her throat at a quite alarming rate and deposited the contents into a handkerchief she’d thoughtfully arranged on her lap. Seriously….252km of hankie chucking. I’ve no earthly idea what she had in there that needed to come out so bad, or quite so often. After finally arriving in Poipet an age later, I had to work out how to buy a Visa. I managed this by hopping a TukTuk and paying a visit to the middle of nowhere to speak to a guy who lived in a tin hut. After a lengthy conversation, of which I understood very little, I handed over some US Dollars and had my passport taken. In the midst of a few minutes of panicking that I’d never see it again and would have to live in Thailand FOREVER, I got it back. It came complete with a funny looking bit of paper, which was then glued to an empty page and thrust back into my grateful little paws. I was then issued some stern sounding instructions, which I didn’t comprehend any more than the preceding conversation, and dismissed, with a wave of a hand, to the direction from where I’d come. Knackered, and feeling mildly uneasy about how valid my visa was, I picked up some basic accommodation in the local area and spent the night at the bar next door. My hosts were fantastic and very friendly and I explained to them about my trip to Cambodia the following day. We were warned of the dangers of the town and not to wander too far from the bar after dark. We didn’t. 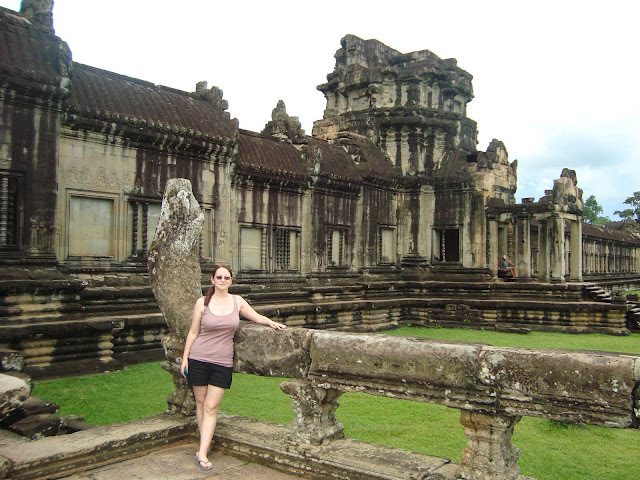 We were also informed about how fabulous Angkor Wat was and that made me more desperate to get there. I spent a fitful night, watching various insects crawling under the gap beneath the door and realising that the lock wasn’t particularly secure. I also made the mistake of opening the curtains to look at the hive of insect activity that was happening outside my ground floor window. You just can’t unsee something like that and I slept little, with one beady eye open, swatting away various unseen creatures. It was a very long night. Bright and early the next morning, eager to get away from the new multi legged friends that had joined me the previous evening (without even offering to pay their share of the room), we headed to the Cambodian border. Border control always makes me anxious. I’m not entirely sure why this is, but I seem to have an automatic guilty conscience, that makes me worry that I’ve done something wrong ALL THE TIME. Feeling a bit out of my depth, and still worrying about the validity of my visa, we found out that we had to stand in two separate queues. As I’m British and Aiew is Thai, we were not permitted to enter the country together. I waited in a massive line that didn’t seem to be moving and was entirely alarmed by the plethora of posters denoting the perils of interfering with small children. I was also taken aback by the sheer amount of rubbish that was strewn around. The ground was covered. After an hour or so of standing around, I was sent to the front of the queue to be stared at for a little while. My passport was closely inspected and I probably looked as nervous as I felt. Surprisingly, I made it through without issue or questioning about where I got my visa, and stumbled outside to wait for Aiew. After half an hour, I started to wonder what could be holding her up. Her queue was considerably shorter than mine had been and yet there was no sign of her. After another 30 minutes of me thinking she’d OBVIOUSLY been marched back to Bangkok and I’d been left, sitting at the border, on my own, and would have to stay there for the REST OF TIME, she suddenly appeared. As it turned out, it was far easier for the dodgy looking British tourist to get through that it was for the upstanding Thai citizen. Who knew? We skipped out into traffic and hailed a cab to take us to the bus station. Once at the station, we then haggled like crazy people for an age, before finding a driver that was willing to take us to the town of Siem Reap for a reasonable price. We followed him out into the car park, where he ushered us into the back of a Lada. I hadn’t see one for decades and, having been the child of a parent that owned one in the 1980’s, I wasn’t sure it would make the distance. I tried to put my fears to one side and strapped myself in for the ride. Ten minutes into the journey and just was starting to unwind, the taxi started swerving across the road and I was cruelly jolted out of my sleep stupor. The driver grinned and apologized to us, saying he was just avoiding a snake. I laughed. ‘I’m sorry, for a moment there I thought you said you were avoiding a snake!. Clearly, I misheard you!’. Not so much. In the two and a half hour journey, we had to avoid many more. And he was right…they were definitely snakes. I sat, meerkat like in the back of the car, panicking every time we stopped in traffic, certain that a snake would take the opportunity to slither up the exhaust pipe at any given moment and choke the life out of me. I was SO CLOSE to Angkor Wat that I sent out a quick telepathic message pleading with the Snake King (that’s definitely a thing) that I wouldn’t mind quite so much if his minions tried to kill me on the way home, just as long as I could see the Temple first. I’m thrilled to report that we made it Siem Reap in one unbitten piece. 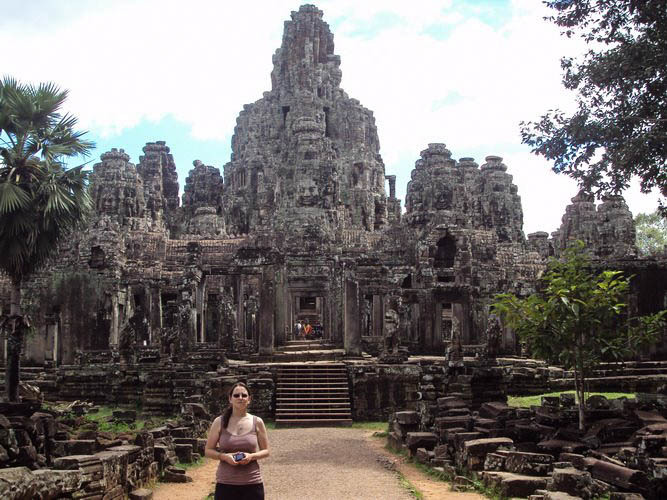 Siem Reap is a province in the Northwest of Cambodia and is a well-established tourist area. It has a wide range of quality accommodation and is a lovely area to spend some time. It largely owes its success to its proximity to Angkor Wat, which is Cambodia’s most visited attraction. We thanked and paid our driver, avoided the masses of stray dogs that were hanging around the local shops, and headed out, on foot, to cross the moat that surrounds the entrance to the Temple. We had travelled more than 400km, spent a total of 6.5 hours in buses and taxis, waited almost 3 hours on visas and borders crossings, but we finally made it! And it was worth every single minute. Angkor Wat is the largest religious temple on earth, so this might give you a sense of how long it takes to really appreciate it on your visit. It is also, rightly, a UNESCO World Heritage Site and, given its age, is in spectacular condition. 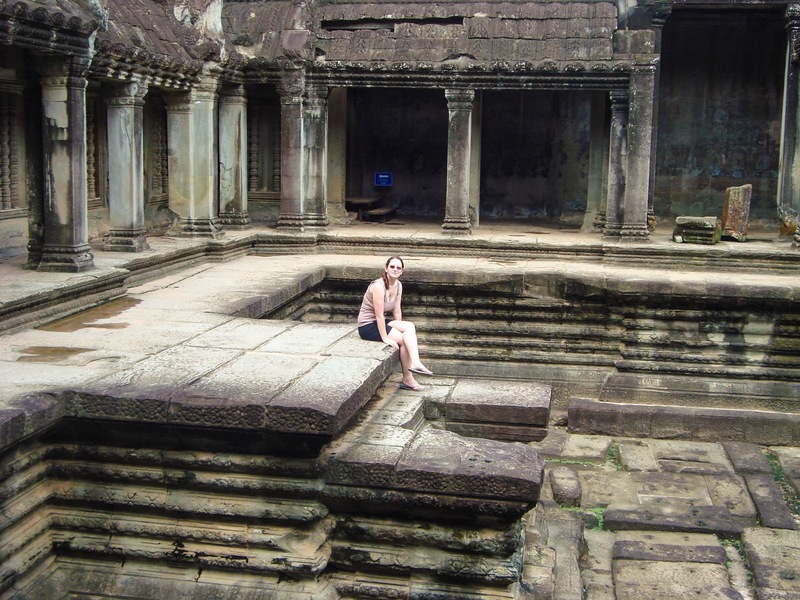 Once purchasing a ticket for Angkor Wat, you are free to wander the site to your heart’s content. As well as the famous temple, even the lesser-known areas are to such a high standard that it will blow your tiny mind. What I didn’t realise before visiting was that AW is not the only temple on the site. Angkor Thom is also there. This isn’t anywhere near as famous (or as big), but is equally breathtaking. Cover yourself in sun cream, wear (very) sensible shoes, try not to think about snakes, and spend as much time in the area as you can. You won’t be disappointed. Also, and I can’t state this enough, absolutely research your travel BEFORE you go.